I’ve had to make a conscious choice about my writing in recent months. Write? Yes, absolutely! But I’ve needed to prioritise which writing to focus my time on. The truth is I enjoy researching and writing blog posts. But in an already tightly scheduled life, every minute I spent preparing posts was time I was stealing from work on my novels. “We’re all busy!” I hear you cry. Indeed we are. “You must post on a regular schedule,” many blogs proclaim. Indeed in an ideal world that is probably true. “Blogging will make you a better writer …” Writing regularly will make you a better writer. Variety is good and blogging is but one great way to do this. Most importantly we must be writing. “It doesn’t take long …” I have found that depends on the topic – some fly onto the page, others need a lot more thought. I started blogging in 2013 and my fiction writing slowed down. Dramatically. Since I’ve taken a deliberate break from blogging, I re-found my momentum. I’ve been more focused and writing with greater clarity. I’ve finished the first draft of my second work-in-progress, completed a couple of rounds of editing on my first novel and gone back to do one on my second. This stage, although exciting, requires a major investment of time and emotional energy. As for most writers, juggling writing, family, work (I have three part-time jobs all of which I love), the usual chores and a healthy lifestyle that includes regular exercise can be challenging. What I have come to realise is it isn’t just about the time. It is also about the mental space to develop ideas and let them percolate; to process and, at times, stand back to gain perspective. To recharge the emotional energy bank. And to deal with the other challenges that life throws our way, especially if prone to be more of an intuitive type. Sometimes we just need to say “Enough!” I applaud you if you are doing it all and managing well and I thank those of you who have shared that you couldn’t. I came to the point that I had to accept my own limitations. As a GP, I’m constantly talking up work-life balance. Writing is a tricky one because it is as much a passion as an occupation. 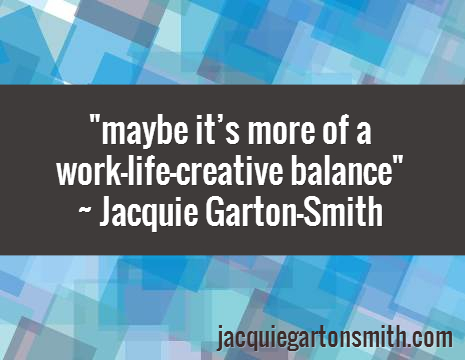 So maybe it’s more of a work-life-creative balance. If the need to prioritise strikes a chord, how might you do so? What do you most want to do? You may know immediately or you may have to reflect on this. There can be more than one but it can’t be everything … anything that isn’t a burning desire should go into the next category. What’s negotiable? Being a fan of writing down what I need/want to get done to release them from my brain without fear of forgetting, I usually have a longish list. Sometimes something gets to promoted to one of the categories above, others slowly get ploughed through when I have a free minute, am too tired to write or need a short break from something else. They do get done but in my own time and not in competition with the more important items. What you have achieved? Acknowledging what you have done is energising. Even crossing something off a list is satisfying, or even better, starting a new list because one has most items completed. Big achievements need even more celebration. REVIEW your priorities regularly. You can shuffle them and sometimes they need adjustment to meet life’s demands. How about you? Have you had to prioritise your creativity? What happened? What did you find useful? Jacquie, this post resonated deeply with me. My energy is limited these days so my life is one of prioritising and being sure I put effort into the things that are not only important to me, but hopefully make some small contribution to others. When I receive positive feedback, not so much for me, more for the positive effect my words have, it’s like a nourishing warm soup on a chilly winters day. My writing mentor has offered to help me publish a book of my poems and for this I’m so very grateful. However it feels important to me that I put my energy into writing when I can. I don’t always read or comment on the blogs of others, and am so very grateful that my small band of regular followers continue to comment in the face of my absence from their blogs. I try to read but don’t always have the energy to respond, with what I feel, is a worthwhile comment. I’d rather not comment than give a less than heartfelt comment. What must you do? I must write the truth that rises up from the depth of my being. What do I most want to do? I rather my words resonate with 6 people than have a hundred people view, but not be touched by my words. What’s negotiable? For me it’s rather what’s not negotiable – authenticity in my writing is paramount. What have you achieved? I reached out and connected with bereaved parents, people whose life partners have died, and connected, supported and been supported by others who live with chronic, life limiting illness. Regarding the review question, that is dictated by my energy levels on any given day. Thank you so much for this post, it has been a gift of clarity for me. Tricia, I am sure the demands on my time are not a scratch on your challenges. I am so grateful for your comments – I am touched that my post has both resonated and prompted you to come up with such beautiful responses. Time and energy are precious resources and I thank you for your contribution. This is so true. We feel guilty when we’re not doing something that we feel we should be, when other things take priority, but that is the way it is sometimes. Besides, blogging really doesn’t NEED to be right up there on the priority scale. I think you made the right decision—writing your novel is much more important, if you have to prioritise. Don’t forget, you’re a mum, a GP working three jobs, and you’re writing a novel—I feel tired just thinking about your schedule! And you’ve had grief in recent months. Thanks Louise! The up-side of finally writing this post is the lovely encouragement from the comments and likes. Something a writer shouldn’t underestimate the value of – novel writing is so much more solitary! Like social media instead of focusing on writing perchance? A timely post Jacquie and good tips. Also just read Claire Cook’s Writer Unboxed article on her book ‘Never too Late: A roadmap to reinvention’, in which she talks of how she keeps her writing on track every day by setting a small goal of two pages (not always a small achievement tho, as things go). But it always seems to me, and past experience has shown for myself, that the busier you are the more you achieve. One never seems to get as much done when you have all the time in the world. Less focus perhaps? Thanks Irene! I also follow Writer Unboxed thanks to your suggestion and Claire Cook’s post had some good ideas. I think we can learn from others but we also need to be true to what works for us. Just two pages certainly doesn’t sound so threatening! Because I work longer hours some days than others I would struggle to write quality fiction every day but I do write something every day. I personally find I prefer longer chunks of time to really get into the flow. I often do what Claire suggested though and reread my last segment to get back into the spirit, especially if there has been a few days (or more) break. Maybe busy schedules force people to structure their time more carefully? Otherwise what you don’t do today you may not get to for a while? We can’t do everything well, I keep hearing (from wise people). It sounds like you’ve reprioritized in a way that will make you feel good about what you’re doing and what kind of progress you can expect to see. I’ve cut back on my blogging lately, too, in the interest of finishing m/s edits (which will be done within the next two weeks, I’m happy to report). Sometimes, something has to give. I have a hard time convincing myself that the world isn’t going to implode because I decided to “neglect” something for a while (or forever, if it doesn’t feel right), but it just keeps on spinning. Funny, that. Thanks Laura – your comments make me feel very supported in my choice. And good luck with the manuscript edits! How exciting – good to have a deadline be it self-imposed or otherwise. Can’t wait to hear more! I’ve just sat down to write a blog post on balance and, as all good writers do, procrastinated by checking twitter! The first thing I saw was your tweet linking to this post – there’s synchronicity for you! My post is about inner balance, but if it’s okay with you I’ll link it to this one as hopefully they’ll complement each other! Sounds brilliant Louise – love these moments of synchronicity and I look forward to reading your post! Essential Principles, Practices and Panaceas, A – Z: Balance | Essential Coaching Inc. Writing comes in category 2 and can easily be pushed aside for category 3 items, but it’s so important not to let it. I’m looking at time management in a course I’m developing called overcoming obstacles to writing & will definitely share your insights. Thanks for sharing. Thanks so much for reading and commenting on this post, Annabel. I am delighted that you thought it was helpful. I too have used Covey’s technique before in grid-form and found it useful, but I find category 2 doesn’t help differentiate things we are passionate about from the other important stuff. You are so right about category 3 items slipping in! Good luck with the course you are preparing! It is wonderful that you will be sharing your tips.